We offer a wide range of glass cutting and installation services to our clients in Hillingdon, Middlesex and the surrounding areas, including Hayes, Uxbridge and West Drayton. Personal or telephone enquiries are always welcome. You will not be spoken down to and any prior knowledge of glass or glazing is either assumed or expected. Our glaziers are experienced in all aspects of the trade and ready to meet your requirements. Glass cut to size while you wait – we carry an extensive range of Pilkington glass products, clear glass in 2, 3, 4 & 6mm thickness and also 6.4mm laminated safety glass. All obscure glass patterns in 4mm and 6mm. We stock 4mm & 6mm mirrors which can be cut, drilled, edge polished & foil/safety-backed on the premises. Double glazed sealed units are made on the premises BSEN 1279. These are available on a supply only basis, or as replacement units (e.g. steamed up units, broken glass etc) or for site glazing to new windows. Units can be made the same day if required. General repairs to picture frames, table tops & mirror wardrobe doors. Painted glass splashbacks are made on the premises. Regular or toughened safety glass is available, as well as low iron (white) glass. As a family-based independent company established in 1963, we have a particular interest in the more demanding jobs requiring that extra element of service and that personal touch. We do see to the needs of each individual client and will try to accommodate them in every way possible. As a company, we would hope to instill confidence in any customer and always endeavour to maintain a ‘hands on’ approach from enquiry stage to completion of works to the customer’s satisfaction. Located in Hillingdon, Middlesex (approximately two miles from Heathrow Airport), we have, over the years, carried out glass installation works in all the airport hotels, from emergency repairs to complete hotel refurbishment projects. Our glass cutters have become renowned for their professional workmanship, punctuality, and first-class service. Knowing the constraints of working in such premises, we believe we have the right approach in balancing the needs of the guests i.e. minimum disruption, against those of the hotel as our customer i.e. fast efficient work carried out in a clean professional way. We currently work for Holiday Inn, Crown Plaza, Marriott, Thistle, Sheraton, and Park Inn Hotels. A measuring, fitting, and fixing service is available to both domestic and commercial customers in Uxbridge and Middlesex. We have many years’ experience working in hotels, offices, and larger houses in Hillingdon, Middlesex and further afield. We can liase with customers directly or with the client’s representatives (i.e. designer, surveyor, architect). All mirrors fitted are either foil backed or safety backed depending on the location and conditions. Mirrors are usually fitted with adhesive, though the more traditional methods of screw fixing or clip fixings are available. Our experienced fitters are ready to meet your requirements. Our glazing service is available for both single glazing and double glazed units. This is predominantly for new developments having timber windows and doors with either plain or leaded sealed units. Our sealed units are made to measure on the premises with safety glass if required. All glazing is fully guaranteed and carried out by our experienced direct labourers. Our units are tested to comply with BSEN 1279. All local repairs can be carried out on all types of windows and doors. We are familiar with all types of wood, aluminium and UPVC systems and can usually carry out a repair on the same or next day (including double glazed units). Our glaziers are fully trained to work in houses, offices, factories, schools, the royal household, hotels, churches, and shops. Each situation has its own Health & Safety implications, which are considered and acted upon i.e. warning boards, out of hours work, erecting barriers and bollards etc. We also subcontract to the London Borough of Hillingdon to carry out domestic and commercial repairs on their behalf. Safety glass is available as laminated, toughened, or wire glass. Not to be confused with security glass, safety glass is glass that breaks safely. As a bi-product of their makeup, laminated and wired glass also offers a degree of security even when broken. Our experienced glass cutters can provide safe glazing solutions to meet your needs. This is regular glass that is cooked and cooled. In this process, the glass is changed to the extent that the glass is made stronger in some respects and also breaks into many small “safe” pieces when sufficient impact is received. Toughened glass is usually available within 3-4 working days, from 4mm to 25mm thickness. This is a stock safety glass which is made from two layers of glass, laminated to a clear plastic interlay. It can be cut to size the same day and is particularly suitable for use in situations where, if it is broken, it will stay in place until a repair is possible. This looks the same as regular wire glass, however, the wires are thicker and this enables it to satisfy the requirements of the appropriate British Standard. It is also fire rated and therefore ideal in fire doors as a relatively cheap alternative to wireless fire rated glass. Traditionally, fire rated glass was only available as wired clear or obscured glass known as Georgian wired polished plate or Georgian wired cast. These are integrity only glasses that can offer a degree of fire protection by stopping the passage of flames but not heat. Insulating glasses are now available that stop flame, smoke and heat transfer. They are wireless safety glasses and are being specified more and more as glass becomes an integral part of the fabric of a building, not just in windows and doors. We can supply and fix most types of fire rated glass. The end user usually is responsible for specifying the particular glass type and glazing material, as this would be detailed in the relevant test conditions appertaining to the frames to be glazed. We are happy to discuss glazing requirements relating to fire rated glass. Though it may appear initially as a minefield, a few simple questions and answers from the appropriate people (i.e. Building Control Officers, Fire Officers, and Architects) can clarify what type of glass is needed. Positioned close to Pinewood, Shepperton, Bray, and Leavesden Studios, we offer a rapid delivery and installation service that suits the needs of the working studio and same day delivery is usually achieved if required. We also measure and glaze on location or in the studios. We carry out repairs to glass roofs as well as offering a supply and fix service in single or double-glazing. Bars can incorporate openers, which can be manually or electrically operated. Solar control & safety film can be fitted in both domestic & commercial premises. We can supply and install on smaller projects and are FENSA registered. We welcome smaller projects where the larger suppliers tend to show little interest e.g. one or two windows, or a replacement front door. 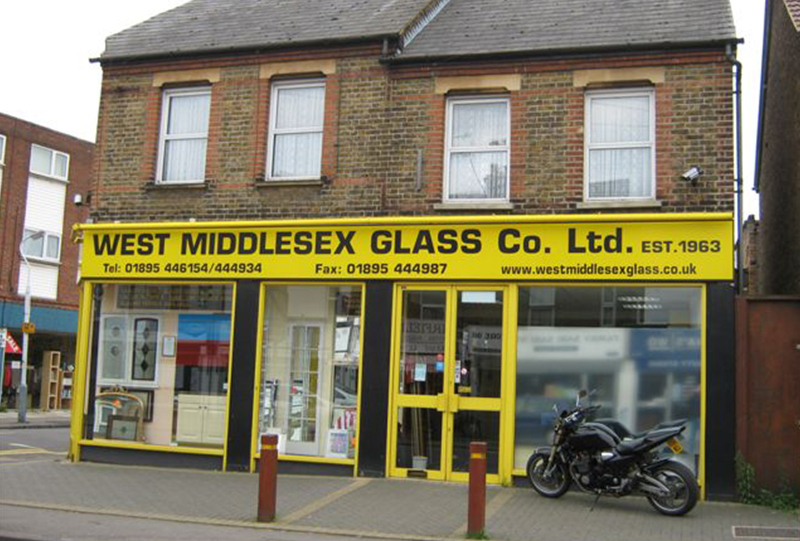 If you are searching for professional glaziers in the Middlesex, Hayes, Uxbridge or Hillingdon area, look no further than West Middlesex Glass Co. Ltd! Call us today on 01895 444934 to arrange a free, no obligation quote.